If your pregnant clients are in the habit of eating junk food then they may well be concerned that their body and their unborn baby are not receiving the essential vitamins ad nutriments necessary for healthy cell growth. Eating healthily during pregnancy is essential for the mother to be in order that she avoids piling on excess weight that could be difficult to lose once her baby is born. The best time to start eating healthily is now - even if conception has not taken place your clients can begin to create the right environment for their babies to thrive and grow. 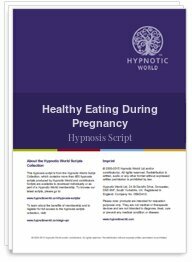 This Healthy Eating during Pregnancy hypnosis scripts can help to lay down the desired formations or - if your clients are already pregnant then it's never too late to quit bad habits.